About us, James and Linda…Married 50+ years , live in Merritt, NC, on a farm that we inherited (my husband was actually born in our home). Our family: 2 daughters, 1 son in-law, 4 granddaughters, 1 grandson, 1 grandson in-law, 2 great grandsons, and 4 dogs. A little bio: James, retired from civil service (computer stuff). Linda, retired from, both, banking and social services (people stuff). How we found, and now own, the "Huntress" is one of those "meant-to-be" stories. It began with James spending a lot of time on the Internet "looking" at boats that turned into "searching" for the boat". Finally, after much searching, James found a 40' 1984 Mainship motor yacht. It was everything we were looking for and the Internet pictures were beautiful. So we packed up the dogs in our minivan and drove to Ft Pierce, FL where the boat was located. Important detail...15 years ago we had purchased a 22' center console boat from our daughter and son in-law. Before leaving for Florida we gave this boat back to its original owners...because we were going to purchase the Mainship! We arrived safely in Ft Pierce, checked into a dog friendly motel, and the next day went to the broker's office to look at "our" Mainship. Whoa! This poor boat did not live up to its internet pictures...it definitely needed some attention. What a let down! But, as we were walking back to the broker's office, I noticed a picture on the boats-for-sale bulletin board. Me..."Jimmy, you will not believe the name of this boat". The boat was named "Huntress"; Same name as our previous 22' center console. Had it not been named "Huntress" we would never have looked at it. The broker saw our interest and added, "She's docked out back if you would like to see her". And "the rest is history". 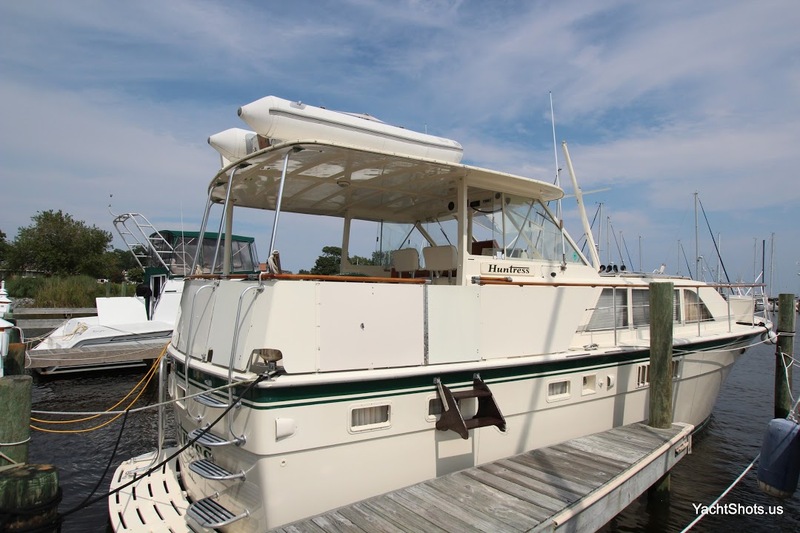 We ended up purchasing this boat and cruising her (another story for another day) back up the ICW to her new home port in Oriental, NC. Then...the "Hatteras named Huntress" became the inspiration for this site.